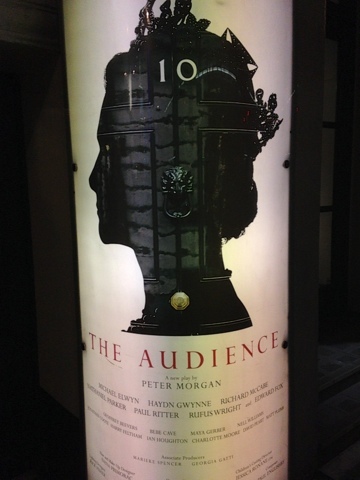 Last night Stu and I went to the famous Gielgud Theatre in London's glitzy West End to see Helen Mirren in The Audience. Written by Peter Morgan (The Queen) it tells of the weekly audiences that Queen Elizabeth has had with each and every Prime Minister over her illustrious reign. Helen Mirren was a marvel - often transforming on stage as the action jumped backwards and forwards in time. We get to meet nine of the twelve PMs - Blair's talks had already been covered in the film The Queen and Macmillan and Heath were no shows - just mentioned in other conversations. No great loss. The talks have never been minuted and so much is speculation but Morgan manages to convince drawing on events of the day. Suez Crisis, marital crisis, personal crises - much ground is covered. In part counsel, in part sparring partner and in part friend the Queen is always outwardly supportive of her PMs. However she is also often questioning and occasionally advising which can lead to perceived criticism - which never goes down well. Famously she was once overtly critical via 'a close source' in the Sunday Times but it was about Maggie Thatcher so we can forgive her that. She had a favourite too. Harold Wilson. He made her laugh. Great show - if you get an chance to be in The Audience - do.